Siam Commercial Bank PCL is one of Thailand s leading universal banks. 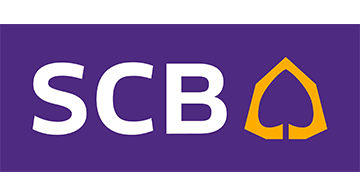 Established by the Royal Charter in 1906 under the reign of King Rama V as the first Thai bank, SCB has the highest market capitalization among Thai financial institutions. Its network of branches and service points offers nationwide coverage with foreign exchange kiosks and ATM machines providing services meeting the demands of all customer groups, including corporate, SME, and retail customers. As a universal bank, SCB provides a full range of financial services. Among these services are transactional banking products, corporate and personal lending, retail and wholesale banking, foreign currency transactions, international trade financing, cash management, custodial services, credit and charge card facilities, and investment banking. Today the SCB group includes three major subsidiaries offering financial services to meet specific customers needs: SCB Securities (SCBS), SCB Asset Management (SCBAM), and SCB Life Assurance (SCBLIFE). The Bank s international presence covers strategically key countries which are Hong Kong, Singapore, Cambodia, Laos PDR, Myanmar, Vietnam and China.